Ulnar nerve is a nerve which runs near the ulna bone. It is a major nerve in the upper extremity that supplies both sensory and motor innervation to parts of the forearm and hand. It is a nerve that arises from the medial cord of the brachial plexus and gives off numerous muscular and cutaneous branches in the forearm, and supplies the intrinsic muscles of the hand and the skin of the medial side of the hand. The nerve is the largest unprotected nerve in the human body, so injury is common. This nerve is directly connected to the little finger, and the adjacent half of the ring finger, supplying the palmar side of these fingers, including both front and back of the tips, perhaps as far back as the fingernail beds. This nerve is mainly responsible for movement of the hand; despite passing through the forearm, it is only responsible for one and a half muscles there. Its primary role is to provide nerve function to the hand. 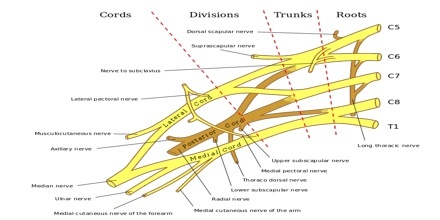 Ulnar nerve originates from the C8-T1 nerve roots which form part of the medial cord of the brachial plexus, and descends on the posteromedial aspect of the humerus. It runs inferior to the posteromedial aspects of the humerus, passing behind the medial epicondyle at the elbow where it is exposed for several centimetres. It is located near the skin surface of the body, particularly at the elbow. This means that general damage to the arm or elbow can cause damage to the ulnar nerve. The ulnar nerve is trapped between the bone and the overlying skin at this point. This is commonly referred to as bumping one’s “funny bone”. 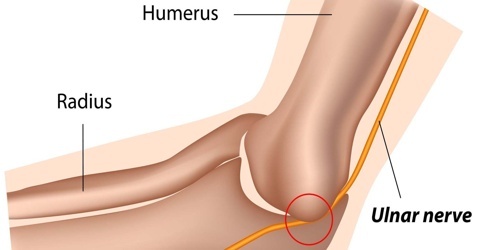 This name is thought to be a pun, based on the sound resemblance between the name of the bone of the upper arm, the “humerus” and the word “humorous”. Alternatively, according to the Oxford English Dictionary it may refer to “the peculiar sensation experienced when it is struck”. Ulnar nerve is responsible for the pain, or ‘funny bone’, sensation that occurs if the elbow bone is suddenly struck. Continual pressure on the elbow or inner forearm may cause damage. 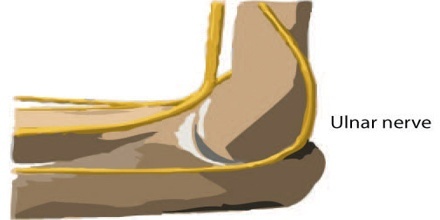 Injury can also occur from elbow fractures or dislocations. The ulnar nerve can suffer injury anywhere between its proximal origins of the brachial plexus all the way to its distal branches in the hand. It is the most commonly injured nerve around the elbow. Although it can be damaged under various circumstances, it is commonly injured by local trauma or physical impingement (“pinched nerve”). Damage to the ulnar nerve causes problems with sensation and mobility in the wrist and the hand. Wrist movement is also often observed to be weaker with damaged ulnar nerves. Reference: dictionary.com, definitions.net, healthline.com, wikipedia.